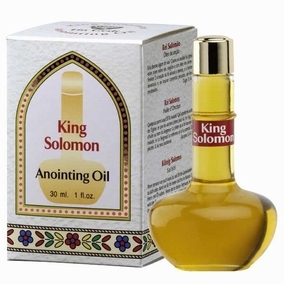 This 30ml decorative jar contains anointing oil named after King Solomon. Anointing oil is used for the purpose of taking on special status before God. Thus oil is throughout the Holy Bible to anoint kings and princes, to consecrate the holy temple and to heal the sick. But the anointing, which you have received from Him abides in you 1 John 2:27. In today's modern word, where we are so rushed to live our daily lives, there is a great need to strengthen our faith by any means possible. Many have the custom to use anointing oil for this purpose, specifically for providing fortitude to those who are ill and to speed their way to recovery.